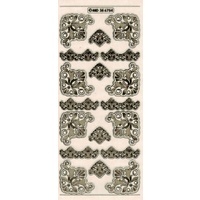 1 x A4 x 125gsm Glamour Gloss Sheet with 2 designs These wonderful Owl themed die cut sheets are great for card making, Scrapbooking, decoupage and many other paper craft projects. All these sheets are pre cut, which means the shapes just "pop out" ready to glue together. Two design projects are shown on this sheet of A4 card each with numbered pieces for easy placement. The sheets also include two borders. Another idea for 3D paper tole designs is to make them into pictures. These would look cute made into little mini hanging decorations.